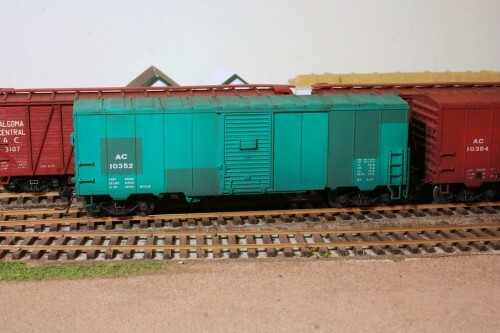 While today’s Freight Car Friday subject isn’t an AC car, nor taken anywhere near the ACR, it is definitely related. This shot courtesy of an antique show find by Keith MacCauley shows an almost brand-new Ontario Northland triple hopper # 6051. 72 of these cars numbered ONT 6000-6071 were built by National Steel Car in 1971 for use carrying iron ore from Adams Mine near Dane, ON to steel mills in Pennsylvania. Canadian National, Ontario Northland, and New York Central/Penn Central provided cars into a pool for this service, with many of the PC’s portion coming from the Toronto, Hamilton & Buffalo and Canada Southern Railways (although that’s clearly an actual PC car coupled at left in this photo). Given the freshness of the ONT car, the date is almost certainly summer 1971. We haven’t identified the location, but it’s likely somewhere in the States. In the late 1970s this service ended, and these cars were disposed of by the Ontario Northland, with the Algoma Central picking up thirty of these cars in 1978. They would run for several years in original numbers with just the reporting marks patched out, and then in the mid 1980s these cars were renumbered from their 6000 series numbers to the 8600-8629 series. Continuing to make progress on my hopper scratchbuilds this week, assembling the body sides and end sheets. 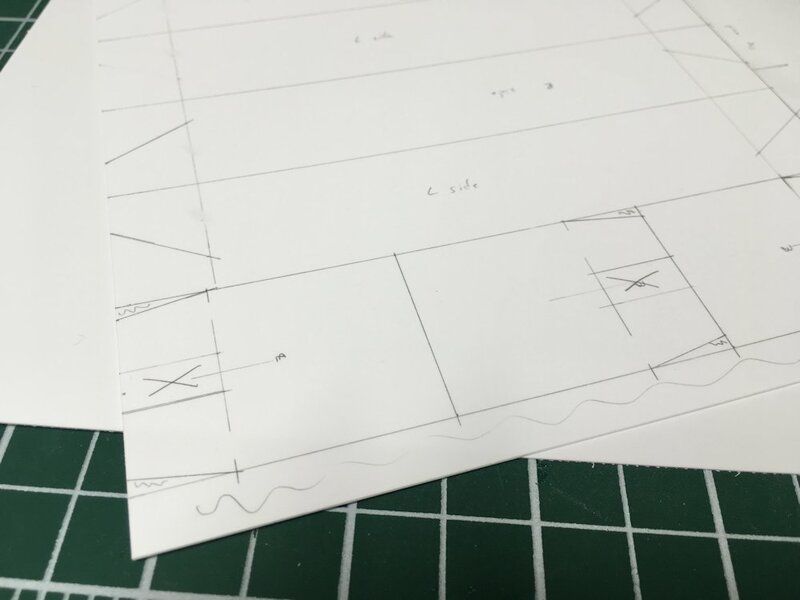 The above photo shows the layout of the end sheets on the styrene sheet, these were laid out and cut out at the same time as the body side sheets. The angles in this project make things interesting, but essentially it’s a fairly straightforward exercise in geometry. The tops of the ends are completely straightforward being a simple flat panel, and with the .060″ square top chord extended around. The square stock was filed to fit and the ends assembled to the bodies. Next step is installing the end slope sheets into the body. The main trick here is to be very carefully to install everything square. I have a few more of the cars to work through this week yet, and then the next step after that will be to cut out and install the intermediate slope sheets for the central bay. AC 6056 at Wawa in March 1981. Slide from my collection, photographer unknown. 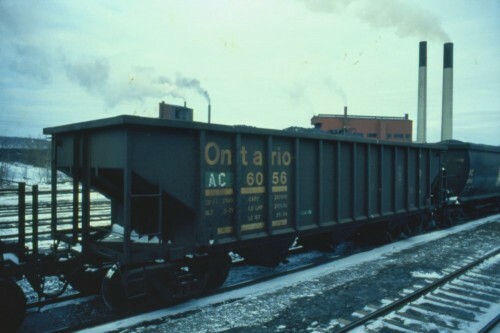 In the 1980s, the Algoma Central rostered three types of 100-ton hopper cars in Wawa iron ore service: 100 of the distinctive and unique round-sided black hoppers in the 8000 series, built in 1971 by National Steel Car, 300 of the green rapid-discharge hoppers also built by NSC (using an Ortner Freight Car design under license) in 1974-75, and 30 “standard” triple hoppers acquired secondhand from the Ontario Northland Transportation Commission around 1978. 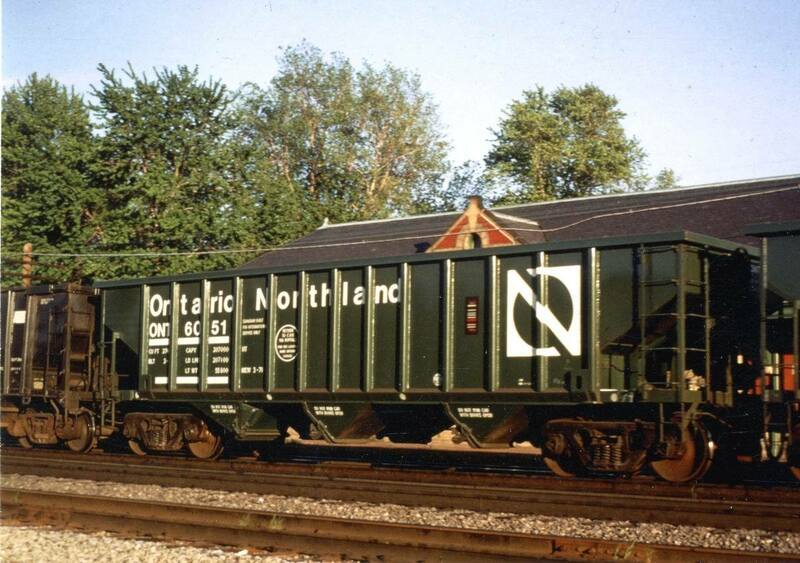 The Ontario Northland hoppers were part of a 72 car series ONT 6000-6071 built by NSC in 1971 and were used in iron ore service from Adams Mine at Dane, ON to a steel mill somewhere in Pennsylvania. For this service, triple hoppers were provided into a pool by Ontario Northland, Canadian National and New York Central (CASO and TH&B cars). Around 1977 or 1978 this particular service to Pennsylvania had either changed or ended completely, and the cars either went back into general usage by their owners (CASO cars were likely renumbered back to original NYC & PLE source series) or were sold off. 30 of the ONT cars were sold to Algoma Central in 1978; I’m not entirely sure where the other 42 ONT cars went initially, but today they can be found on the New Hampshire Northcoast Railroad in New England. When first acquired, the cars were just given AC reporting marks and kept their original numbers for a few years, but were later renumbered into the 8600-8629 series sometime around 1984. AC 8620 at Scotch Block (Halton Hills), ON October 18, 2008. Photo by David Graham. All the years of weathering have obscured the original colour and much of the lettering, but these cars were painted in the Ontario Northland’s dark green “Progressive” scheme. While basically a standard design for a hopper, there’s no model out there that exactly matches this car. 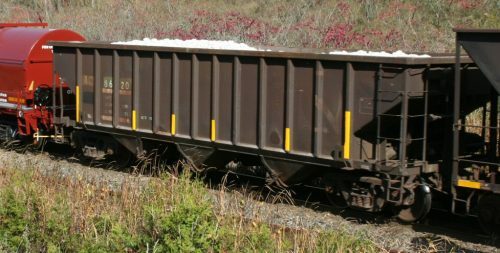 These are relatively modern welded cars built in the 1970s, but as they were intending to haul iron ore and rock, their size is much smaller than many other modern cars. Most models that are out there that are of an appropriate size tend to represent 90-ton cars a few decades older than these cars, with a different number of side posts/panels and riveted construction. One could accept a riveted car as a stand-in, but the difference in side panels causes issues for the spacing and placement of the lettering. First of all, I spent time carefully working up my own scale drawings as a guide for this project. 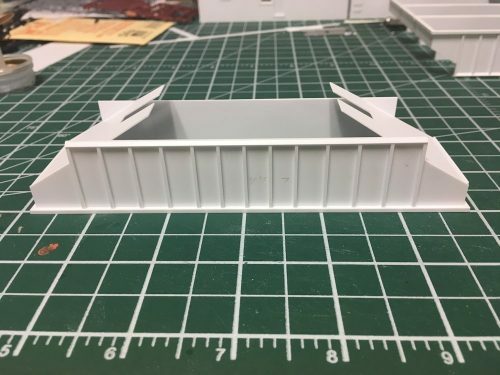 With the angles involved with the hopper bays, it’s a little more complicated of a build than a small shed or something. Using equipment registers I can find out the major overall dimensions, and using some relatively side-on photos available online, I was able to scale out a few dimensions and work up a drawing. Basic undetailed scratchbuild hopper side. The basic sides/end are constructed from .020″ styrene plastic sheet, with HO scale 4×4 side posts and an .060″ square top chord. To represent the angled bracing at the bottom, I cemented a strip of .060″ angle, open-side down along the bottom edge of the car side. (The bottom of the side posts are all cut off at a 45 degree angle with my Chopper.) General side dimension notes – top of side: 40’6″; top chord overhangs by 6″ for length of 41’6″; height of side: 7’6″, length of bottom of side: 31’6″ (length of bay cut-out: 4’6″), height of top ends, 2’9″. Note the different spacing between the ribs at the middle of the car compared the outer bays – this was deliberate and I took a lot of time to try to make sure the panel widths were scaled out properly based on the prototype photos. I worked it out to about 25″ between the 4″ ribs (or 29″ rib centrelines) for the four middle panels and 30″ (34″ rib centrelines) panel width for the outer panels. 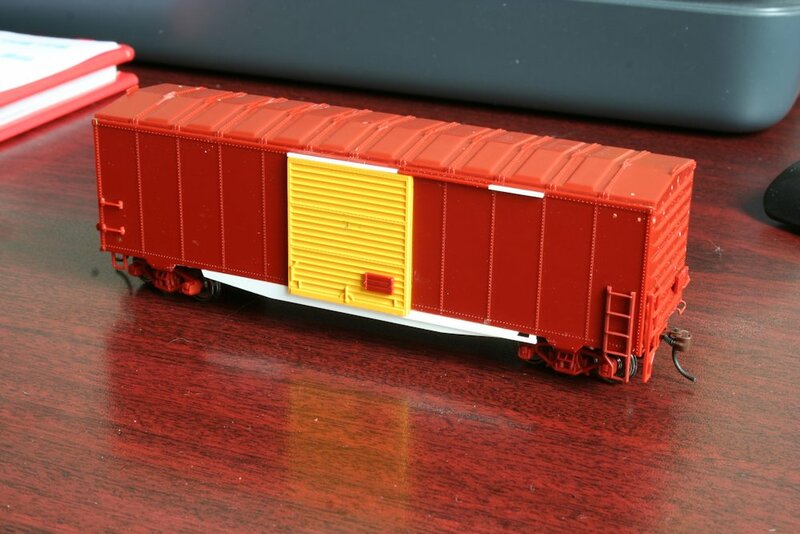 Note: for anyone working in N-scale, I found this model on Shapeways. Enjoying a weekend at home by myself to get back into a few projects. 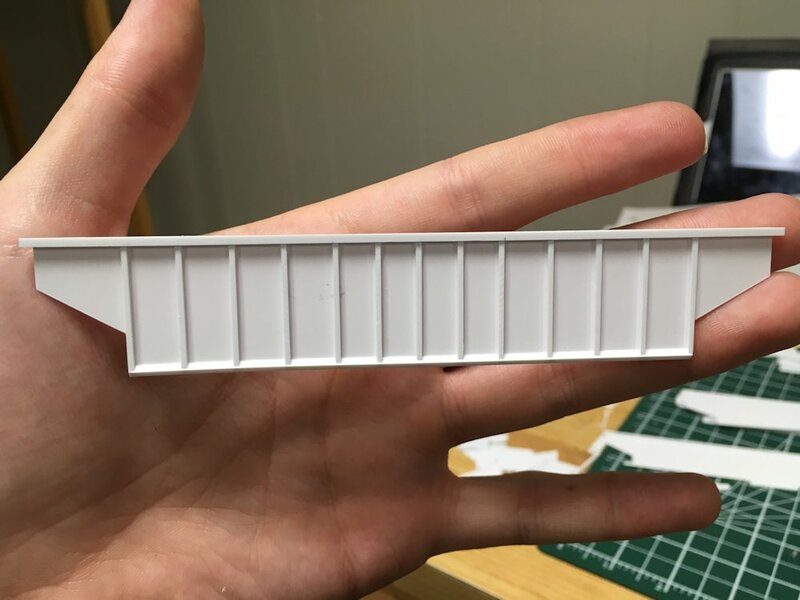 One project that received a fair bit of attention today was finishing off the paint, lettering and weathering on a few of the Algoma Central 40′ boxcars I’ve had in progress for a while. Three cars are now basically complete, with three more in various stages of lettering (included the 9′ door rebuild which will become AC 2917. It’s now on the workbench in green and yellow and half lettered. A little ways to go on that one yet.) 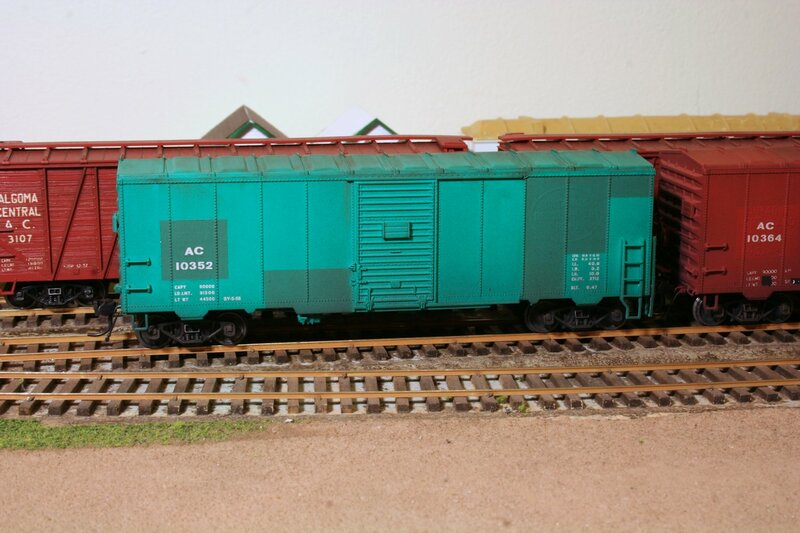 When all six are complete, I’ll have four 2900 series general service (but still non-interchange) boxcars and two 10000 series work supply/tool cars. Here’s a few roster shots of the three finished cars. They’re all TrueLine Trains Ontario Northland NSC 40′ boxcars with custom paint patches and lettering. Weathering is a combination of airbrush and pan pastels. 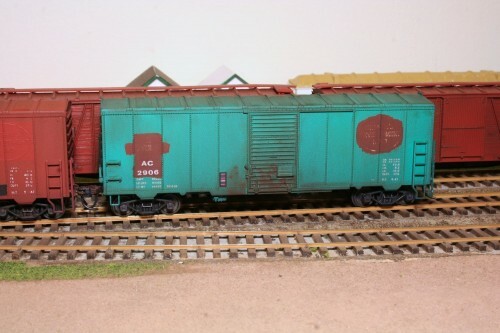 AC 10352, tool/supply car. The prototype car also has turbine style roof vents and a step below the door which will have to be added. The step won’t be a problem, but I’m not sure how to solve the ventilator detail yet. AC 10364, tool/supply car. Like 10352, it just needs the addition of roof vents (although a different sort) and a stirrup step under the door to finish off. The photo loses some of the detail and character of the weathering, and this car actually ended up a fair bit dirtier than the prototype photos of this specific car that I was working from, but it’s not atypical of other cars in the series, and I actually like the final look, so I think I can live with that. 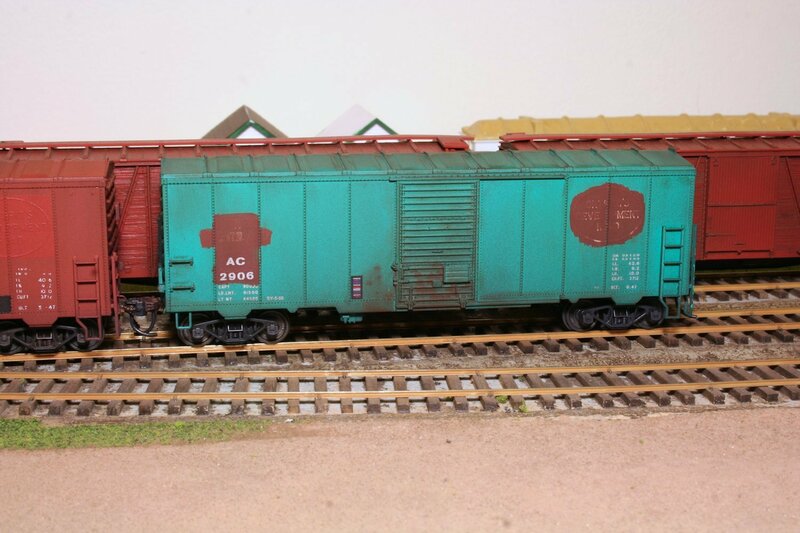 AC 2906, general service boxcar. I sanded the paint patch a little to let some of the original “Ontario’s Development Road” logo show through a bit. Like the other two cars this car received a general grunge with the airbrush and streaking and detail work with pan pastels. I also tried to get a bit of rust splotching going on in the door using a little bit of acrylic paint and pastels. The weathering isn’t quite to the level of some other things I’ve seen online (some of which will blow your mind) but it’s serviceable and I’m still learning and getting the hang of it. 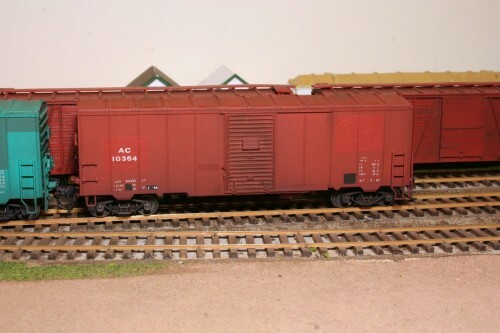 A while back I stripped the paint on a handful of True Line Trains 40′ Ontario Northland boxcars in preparation for modifying and repainting them as cars acquired second hand by the Algoma Central for LCL and company service. Naturally, these then sat on the workbench for a while awaiting detailing and painting while I tackled other projects. Last night I pulled these back out in order to start finishing off the details and get them ready for painting. First up is this car which will end up representing AC 2917. This car was built in 1947-48 by National Steel Car for Ontario Northland and rebuilt by the ONR in the early 1960s with a 9′ door opening. This rebuild required reinforcing of the side sill below the door opening and new door tracks. Note that the new doors used were taller than the original doors, being meant for a 10’6″ interior height car while the Ontario Northland boxcars were older cars with a 10’0″ interior height, so the door tracks in addition to being longer to accommodate the larger size of the door are mounted lower down. The doors on the True Line model are unfortunately molded as part of the car body, so the first step of the major modification was to cut this opening out entirely. 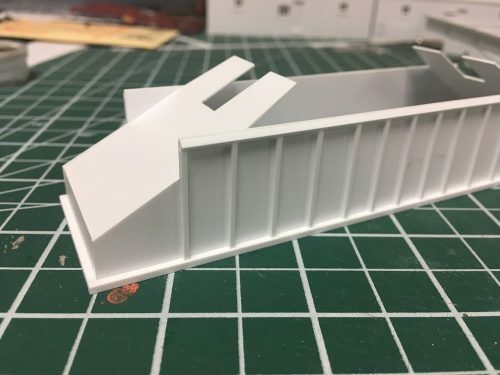 The side sills also had to be carefully cut off along the bottom edge of the car body so that new side sills and door tracks cut from styrene strip could be added. I don’t really recall where the doors came from originally, I pulled them out of my parts box where they’ve been for a while. After removing the ladders and brake detail, original mounting holes were filled in with round styrene rod and the ladders were shortened and reattached. Tackboards on the doors and ends are original parts from the model relocated. The brake wheel housing was also remounted lower down. This car just requires a few more of the brake detail parts to be re-applied on the “B” end of the car, and also the addition of a new horizontal grab iron on each end (I couldn’t find my small diameter brass wire last night) to complete the detailing. Then it should be ready for the paint shop. I have a few more cars that basically just need all of the ladder and brake detailing work done which I hope to complete over the next week and then I should have a small fleet of about half a dozen ex-Ontario Northland boxcars for work and wayfreight service.